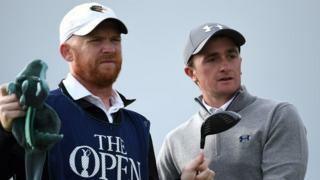 Irish amateur Paul Dunne says he felt "pretty comfortable for the whole day" as he posted an impressive three-under-par 69 in the first round of the Open Championship at St Andrews. Dunne made it to the Open for the second consecutive year through qualifying at Woburn. "I was nervous at first but once I hit my first tee shot I was fine," said Dunne, who added that he had benefitted from some great Irish support around the Old Course.